> The “still, small voice” in the brain has been found! The “still, small voice” in the brain has been found! Joan of Arc is said to have heard voices, it’s a well-known fact. But we ourselves also hear voices, without even being mystics – and especially our own. We are constantly talking to ourselves. Where does this imaginary sound impression come from, this invented sound? Where does it resonate in our heads? A collaborative effort between the INSERM researchers at the Lyon Centre de Recherche en Neurosciences and the Grenoble C.H.U. has just shown that our brains can react as if we were hearing someone talking to us even though no one else is in the room. The research has been published in The Journal of Neuroscience. 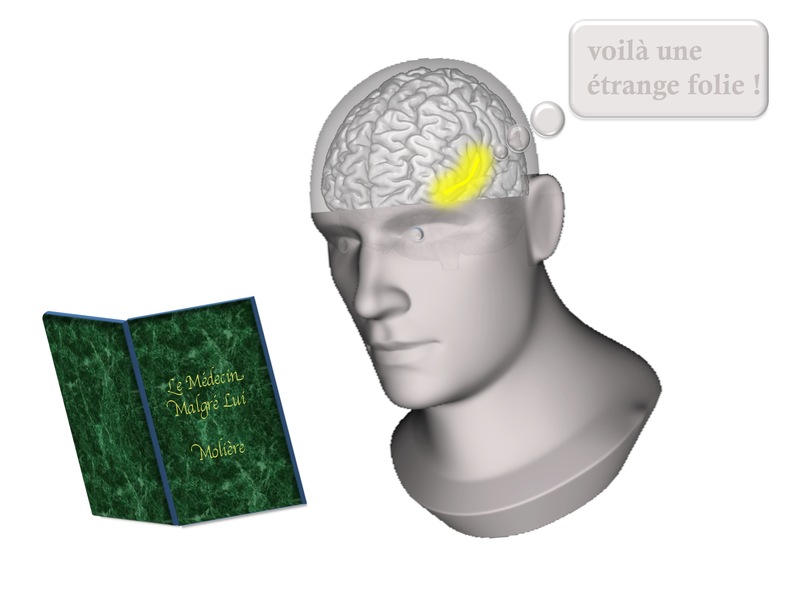 The team directed by Jean-Philippe Lachaux, INSERM’s Director of Research was interested in a situation particularly suited to hearing the “still, small voice”, that of reading to oneself. By directly recording the activity in the auditory regions of the brain that specialise in processing voices, the researchers were able to establish that they were active when reading to oneself, i.e. when the only auditory impression is indeed that of the still, small voice inside us. Although this research only covers the reading situation, the researchers established the proof that it is possible to directly detect the moments in which someone is thinking, and even to know which thoughts are of a rather verbal nature. But be aware that we are still a long way away from finding out what a person is thinking. In the long term, there are numerous potential applications, for example, to consider creating learning tools that would prevent a jumble of thoughts when they become too numerous, or in the case of depressing rumination (successive, interlinked negative thoughts that eventually preoccupy the whole attention of those suffering from depression) or schizophrenia. Hearing the brain talking to itself. One often hears the sound of one’s own voice resonating in one’s head – when reading in the silence of a library, for example. The impression of hearing is due to spontaneous activation of the auditory parts of the cortex, those normally used to analyse the sounds that reach us. It is therefore possible to observe the brain talking to itself. Is Our Stubbornness Caused by Confirmation Bias? What is the Origin of Human Social Intelligence?